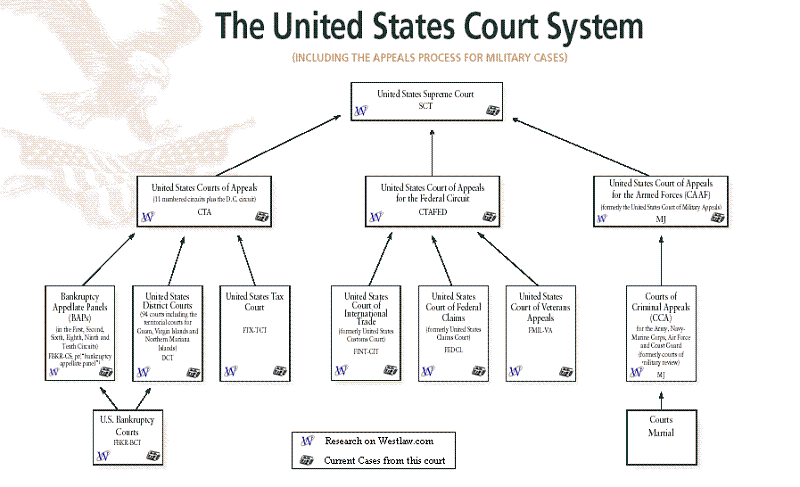 The diagram show us the flow of power in each branch of Court under the Supreme Court. Every Court may strikes different cases as its fungtion. Each fifty states has its own court system to hear cases arising from state laws. In addition, in some cases the jurisdiction of the federal and states court overlap. Both States and Federal law hear some similar cases, such as kidnapping, but for the crimes of murder heard by the states. All we know is, every district court has its own characteristic, but we also remember there’s a dealt between fifty district court, kind of basic arrangement, which it be a based of each Court to work. At all levels, including appointments to district courts, judges are chosen by President and then confirmed by the Senate, and there are nine justice on the Supreme Court whose led by the Chief Justice. There are also any requires why a candidate being choosen, that are, the nominees should have a good rate by The American Bar Association, the nominees should be strongest than his opposition (the pressure group), balancing means that the nominees is not just from an anglo-saxon men but in fact many of them is an anglo-saxon, the place where the nominees from is also influencing, and the last is payment for political debts. The confirmation by the Federal judges requires a vote by majority of the Senate. There also main challenges to find any candidates who would not resign as soon as more attractive position become available. The president and the considerable time and effort preparing for the confirmation process. The first, pressure group will issue press release and produce television adverts supporting and opposing the nominee, with a view to putting pressure on the Senators. Then nominees are expected to meet with Senators of both parties to discuss any issues or concern they may have, and also expected to fill out a quitionare, explaining their approach to making judgement and indicating their views on the major issues of the day. They also have to testify at hearing held by the Judiciary Committee to attempt the influence the committee’s decision, when the judiciary committee supports a nominee, the whole senate votes on whether to confirm the appointment. Nowadays, President and the person who has been nominated have had to devote considerable time and effort preparing for the confirmation process, and then the Senate allow the minority to blok anything they feel too strong about as its procedure named filibuster, to make this mechanism work well, if sixty Senators has give their vote the filibuster will end. As the constitution requires a simple majority to confirm nomination, fifty-one votes should be enough for an appointment to be made. Since its 1954 ruling in Brown v. Board of Education, when it declared racial segregation to be unconstitutional, the Supreme Court’s role in extending rights to marginalized groups has generated high emotion across the United States. As the President can serve a maximum of two terms (eighty years), but judges are appointed ‘during good behaviour’ until they retire, the President can use their choices’ power to influence policy for many years after leaving office. Democrat President tend to be more liberal and prefer to appoint this kind of ‘activist’ judge. Opposite with the President from Republican whom likely tend to be more conservative and prefer to appoint this kind of ‘retrained’ judge who is reclucant to use the powers available to the court to shape US society. For liberal groups, a Federal Judiciary made up of the people who do not share their commitment to defending hard-won rights threatens the core American constitutional values of liberty and equality of opportunity, and for the conservative groups, the Court’s tendency to invent new rights not found in the text of the Constitution amounts to a krytocracy, a government of judges. In fact, the consequent of public security nominees is made even more intense. If we take a point from both groups, both sides has had show us that judicial appointment has become crucial importance, and both sides also mindful of the potential impact of a public battle during conformation hearings, so their both are maintaining substantial financial war-chest in case such a battle never end. To decides which cases should be heard, either a lower court may send a case to the Supreme Court, by issuing a writ of certiorari, or the Court can be petitioned to hear a case involving a serious constitutional issues. So then, all cases would be summarized by the law clerks of Justices, and then considered, the important one is there need about four Justice who agree the case to be accepted. When a Court has accepted a case, the lawyers for each side present a brief, it’s written statement with their legal arguments, any relevant facts and supporting precedents. Briefs, called amicus curiae or ‘friends of the court’, may also be submitted by other group with an interest in the case, usually pressure groups or government department. A date will be set for oral argument, when each side will have thirty minutes to summarise their key points, after read the papers and heard the argument, the Justice meet and discuss case and vote. The votes has equal weight, but unanimous’s vote is not required to reach decision, a majority decision will be written, and the minority will explained their points of disagreement in a dissenting point, Judges can add points to the two main opinions by writing concurring opinions. The clerks also play the important rule, they often write the first draft of the opinion to be presented by the Justice they work for, which, sometimes, is not amended. Until 1935, the Court met in a windowless committee room in congress, as the Founding Father had had declared, that should be didn’t seem to occure to anyone to provide a building for the Supreme Court when new capital city was built on Washington. The first Court’s decision is that the citizen had the right to sue the state. There are also two competing views on how vast power of the Federal Court might to influence the US society, that is, judicial restraint and the judicial activism. This way is known as loose constructionism. When the judicial review gives judges enormous power, it’s not unlimited, but they have a range of factor that restrict their powers, such as, legal process, court traditions, lack of enforcement power, public opinion, and the last are check and balences. In Plessy v. Ferguson (1896), the Supreme Court upheld a Louisiana law that provide for ‘equal but separate accommodations for the white and colored races’. A similar approach was taken during the Great Depression in the 1930s, when the Supreme Court declared unconstitutional laws which they believed undermined the system of federalism, designed to stop the government in Washington from gaining too much power, its all used to retained the power. There also need to be active using the power. For example in 1970, the people use mass protest of the Civil Rights Movement had faded away as their power, in the other hand the Federal Courts also play a role in maintaining the drive for racial equality, active in criminal justice areas in Miranda v. Arizona cases, and any other. Knowing about the prospect of the Supreme Court, we should remember that the vote of the justice is unpredictable, for we can’t now how the policital activist and the commentators will be compared with the retired justice when the political activist and the commentators were analyzed in detail the judgement and the decisions of joining the Supreme Court. Predict the cases which should be the controversial issues at the day and the cases would be a controversial a years later is also more difficult, because there were many aspects that might be influenced the cases and the public opinion. The USA has always been devided by what it means to be true to its constitutional ideals, and will remain so whatever the future brings.